Voters appeared to approve Measure G, which directs the city of San Diego to sell the land under and around SDCCU stadium to the university. The university will now face immense pressure to purchase the land and raise capital to develop a new stadium for its football program. In June 2016, a group of investors partnered with San Diego State University to present their idea for Mission Valley to the mayor and the leader of Major League Soccer. The vision had it all. The investors promised a river park. They would build a stadium and entertainment district around it. SDSU would have a place to play football. The investors would finance it all, and their purchase of a share in the soccer league, with the construction of homes and hotels. They did not know then that they had put in motion an entirely different outcome. Now, two years later, not only is the partnership between the university and SoccerCity a distant memory but voters ended up telling the city that no, the land should go to SDSU and SDSU alone. Tuesday, voters appeared to approve Measure G – a short initiative that directs the city of San Diego to sell the land under and around SDCCU stadium to the university. They also crushed the SoccerCity vision: More than 70 percent of voters had rejected Measure E as of results available early Wednesday morning. Now, the city and university will embark on an unprecedented negotiation to decide just how much the land is worth, how and when SDSU can take control of it and how the university will “cause” the 34-acre river park to be revitalized and restored on land that will remain under the city’s control. Even when that deal with the city is settled, the university’s challenges only shift. It will have to come up with $550 million to buy the land, kickstart construction and build a stadium. The first challenge is just making sure the initiative sticks. San Diego City Attorney Mara Elliott still believes that what voters approved is illegal – that it illegally ties the hands of city officials, forcing them to sell the land to the university. She would have to go back to the City Council, however, to get approval to prove that. She lost an attempt to have both Measures G and E thrown off the ballot. Judges didn’t rule on the merits of her claims, however. They just declined to stop the initiatives before voters had a chance to weigh in. Now, Elliott would have to go back to Council to get authorization to challenge the measure. “The city attorney does not currently plan to request authority to litigate the ballot measures. However, as discussed in our office’s reports, there is some ambiguity in both measures which may require interpretation by the courts,” her office said Tuesday in a written statement. Elliott is clearly aware of one fact: A super-majority of six of the current sitting City Council members endorsed Measure G. They were not alone. Previous ballot measures in recent history attracted bipartisan support. But they were usually tax increases – hold-your-nose deals hammered out by political elites and sold to the rank-and-file members of labor and business coalitions. Measure G, though, launched with the support of only its backers. Over time, it attracted the most diverse support of political players and organizations possible: labor, the Chamber of Commerce, the conservative Lincoln Club, environmentalists, rival developers and philanthropists. 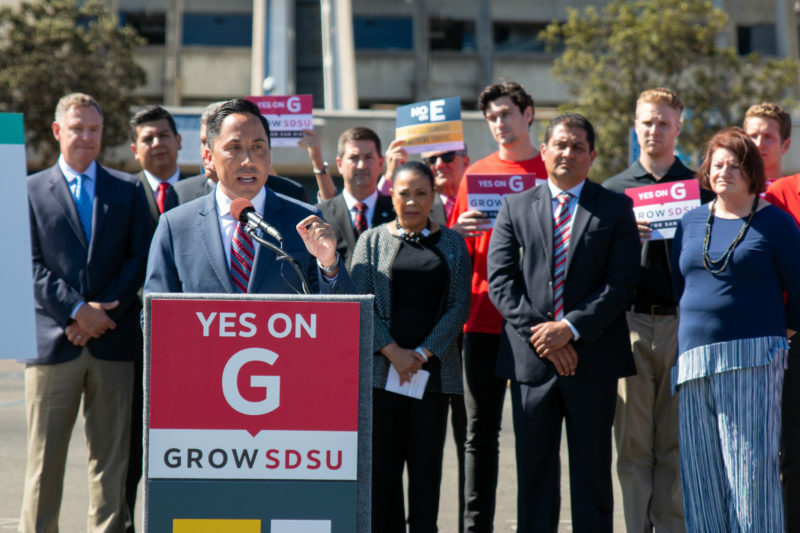 Almost every major politician in the San Diego region supported Measure G.
Jack McGrory, the former city manager turned investor and developer himself, was one of the founders of the initiative and had been instrumental in leading SDSU away from what he considered a bad partnership with SoccerCity. McGrory said he didn’t think the initiative would attract the support it did. “SDSU is a great brand, we probably underestimated the value of the brand. It had been seen as a stepchild of the university system in San Diego, behind UC San Diego. But it has emerged as an academic and athletic powerhouse,” McGrory said. The initiative had the overwhelming support of local leaders, that is, except for Mayor Kevin Faulconer. Faulconer was an early supporter of SoccerCity. He oversaw the development of that initiative, and tried, repeatedly, to salvage negotiations between SoccerCity’s partners, its detractors and SDSU. He assumed, wrongly but repeatedly, that the university, the city and the soccer investors would eventually come to terms. Despite his deep ties to SDSU – where he had once been student body president and a leader in the campaign to build an arena on campus – he never supported the SDSU West, Measure G. Like so many of his other efforts, Faulconer’s push for Measure E became forgettable and ultimately humiliating. You could sense he saw the writing on the wall months ago, but he stuck with SoccerCity and focused his attention elsewhere. Now, he will have to hammer out a sales agreement with his alma mater for the city’s most valuable piece of underused land. The path he picked has left him with severe limitations. The initiative “directs” the city to sell the land to the university, which gives SDSU tremendous leverage. In addition, Faulconer has now lost an ally on the City Council – Councilwoman Lorie Zapf – and he’s going to have to manage this deal with a somewhat hostile super-majority watching over him, if not overriding him. “Citizens’ initiatives are by design outside the control of government. They march to the beat of their own drum whether we like it or not,” said Aimee Faucett, the mayor’s chief of staff, in a written statement. The beat of this initiative drum is over. The Friends of SDSU have now handed actual SDSU officials a gift but also an overwhelming burden. The university will face immense pressure to purchase the land and raise capital to develop a new stadium for its football program. No partners exist to help pay for the stadium yet. It’s a hard path. But they have the overwhelming support of San Diego to go through it.